From Los Angeles to San Diego this was the back of the train. For the return trip the train simply reverses and it becomes the front. 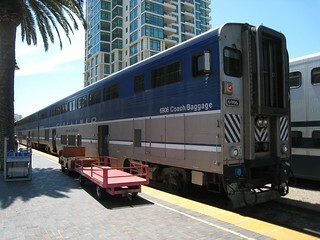 Amtrak, in its wisdom, also moves business class from one end of the train to the other so that it stays at the front of the train. As a result one car always runs empty, even on standing-room-only trains. Awesome!